A rare mapping of the briefly extant Confederate State of Arizona. Johnson's California, Territories of New Mexico and Utah. One of the scarcest and most historically significant of A. J. Johnson's southwest series. Published in 1863 at the height of the American Civil War, this stunning map depicts the state of California and the territories of Nevada, Utah, Colorado, New Mexico and Arizona. 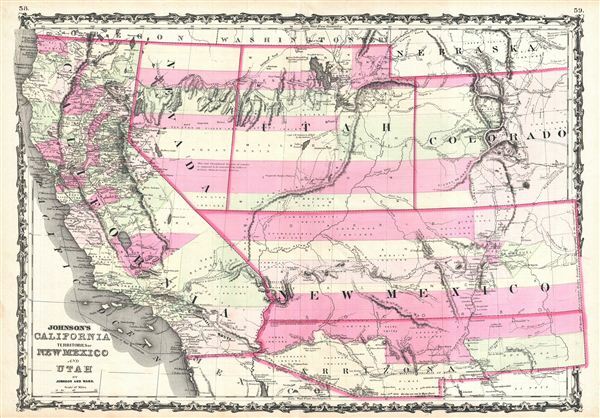 Representing the third state of the Johnson southwest map, this map varies most significantly from its 1861 predecessor in the addition of a clearly defined Arrizona (yes, with 2 'r's) Territory. In 1861 'Arrizona' was an alternate name for the lands added to the New Mexico territory by the 1854 Gadsden Purchase. With only a small population and minimal political influence this region was largely ignored by the New Mexico territorial government in distant Santa Fe. Arizona applied several times to be granted independent territorial status, but its low population caused the request to be repeatedly denied. At the outbreak of the Civil War, Arizonans recognized an opportunity to appeal to an alternate body for the political needs of the region and threw in their lot with the secessionist southern states. Around this time the Union began to withdraw troops from the region in fear that Santa Fe would be attacked by Confederate soldiers operating out of Texas. In Texas itself the Confederate Col. John Robert Baylor, recognizing a strategic opportunity, led his troops into Southern Arizona. In a series of brilliant tactical maneuvers, Baylor defeated the much large Union garrison and seized Fort Fillmore and Messilla. Shortly thereafter Baylor declared himself Territorial Governor of the Confederate Territory of Arizona including 'all that portion of New Mexico lying south of the thirty-fourth parallel of north latitude.' The Confederate Territory of Arizona lasted less than a year before it was seized by the Union Army and dismantled in favor of the current configuration with the Arizona – New Mexico border situated along a north-south axis. Some have suggested that the current border between Arizona and New Mexico was chosen for no other reason than that it differed from the Confederate border. However, it is far more likely that this border was influenced by the prospect of a Southern Pacific railroad route. If the Confederate boundaries had remained the railroad would have would have run only through Arizona, thus denying New Mexico the political and business opportunities that would have inevitably followed. A longitudinal border, however, allowed both territories to be enriched by the Southern Pacific Railroad. This is one of the few maps issued during this short and politically volatile period to specifically depict the Confederate Territory of Arizona. This example also varies from the previous state of the map in that the California – Nevada border has been corrected to a straight line between Pyramid Peak (where several Mormon settlements are noted) and Fort Moliare. elsewhere on the map, Utah and Arizona are split up along the 116th meridian, far west of where it sits today. Fillmore City is shows as the capital of Utah though Salt Lake City also appears. In Colorado the Gold Region near Colorado City is prominently depicted. Throughout, this map is full of interesting and sometimes erroneous notations regarding natural features, Native American tribes, proposed railroads, mail routes, explorer's tracks, and treaty lines. In the highly desertous region near modern day Quartzite, Arizona, a note reads 'in the vicinity of this place a tract of country is found which is said by Trappers to be exceedingly and fertile and abundantly timbered and well watered.' Johnson also notes silver deposits in this same region. 'Vegas' appears roughly in its current location though at the time there was little there but a natural water source and an abandoned Mormon fort. The famed Pony express Route is delineated as it passes through Nebraska, Utah, and Nevada on its way to California. All in all, this is an extraordinarily example of one of the scarcest and most desirable 19th century American atlas maps of the southwestern part of the United States. Published by A. J. Johnson and Ward as plate numbers 58 and 59 in the 1863 edition of Johnson's New Illustrated Family Atlas. Johnson, A. J., Johnson's New Illustrated (Steel Plate) Family Atlas with Descriptions, Geographical, Statistical, and Historical. (1863 A. J. Johnson & Ward edition) Johnson's New Illustrated Family Atlas was produced in numerous editions from about 1860 to 1887. Johnson's first atlas was mostly likely the 1859 edition of Colton's General Atlas which both aesthetically and comprehensively very similar to the 1860 first edition of the New Illustrated Family Atlas. Johnson's atlas was noteworthy in its day as one of the few commercially produced American atlases that could compete with more established European Atlases. Although he called the atlas 'Steel Plate' on the title page for marketing purposes, Johnson in fact incorporated modern lithographic printing techniques and lower quality woven wood pulp paper to economically produce large format maps in quantity. He also began publishing the New Illustrated Family Atlas on the cusp of the American Civil War, a decision that proved fortuitous, as the war corresponded to a general increased interested in cartography. For the most part, Johnson's Atlas was sold by subscription; nonetheless it became so popular that for at time he was considered the largest publisher in the world. Other than the first edition, the atlas itself has no true editions. Rather, Johnson incorporated updated maps as they became available, so each example of the Johnson atlas might well contain unexpected and scarce individual maps. Johnson's map of the American Southwest, for example, appeared in more than 17 different states, each illustrating minor variations to the rapidly chasing geography of that region. Moreover, Johnson's offered a service whereby he would mail updated map pages that could be tipped into older atlases to keep them current. Generally speaking, Johnson's atlas was issued in four periods - each defined by a distinctive decorative border. The earliest edition featured a strapwork border that appears as rolled and decoratively cut leather. This borderwork remained in use until 1863. In 1864 Johnson started using an updated fretwork or grillwork border that resembles worked iron - as in a decorative fence. This border was in use from 1863 to 1869. The 1863 edition of Johnson's atlas used both borders and is considered transitional. From 1870 to 1882, Johnson introduced a new border that featured elaborate Spirograph style geometric designs, which was used from 1870 to 1882. After 1880 a new border different but aesthetically similar to the Spirograph border began appearing. Certain editions of the atlas issued from 1880 - 1882 were transitional. Very good. You would be hard pressed to find an example of this map in a better condition. Near perfect condition. Unlike most examples this map has no centerfold discoloration or other damage. If you are looking to add an example of this map to your collection, this is the one you want. Text on verso.